The first Sunday of Advent is always the Sunday that falls closest to November 30 (Festival of St. Andrew, Apostle). That means that some Advents have three Wednesdays and some have four. This year we will have three. We will be presenting our pledges for the coming year during the worship service. The readings for this coming Sunday are: Jeremiah 33:14–16; 1 Thessalonians 3:9–13 Luke 21:25–36. 9For what thanksgiving can we return to God for you, for all the joy that we feel for your sake before our God, 10as we pray most earnestly night and day that we may see you face to face and supply what is lacking in your faith? 11 Now may our God and Father himself, and our Lord Jesus, direct our way to you, 12and may the Lord make you increase and abound in love for one another and for all, as we do for you, 13so that he may establish your hearts blameless in holiness before our God and Father, at the coming of our Lord Jesus with all his saints. My Initial Thoughts: Timothy has sent Paul and encouraging report and Paul is responding to that report. Even though Paul is currently undergoing “distress and affliction” the good report has brought him comfort and joy. Therefore he thanks God for Timothy and the church at Thessalonica. Paul hopes that the Lord will allow him to visit, but more than that he hopes the congregation continues to follow the Lord’s guidance. The end result being that Jesus establishes their hearts as blameless in holiness before the Father. That is to say, they are confirmed in their faith in Jesus, who we saw in our reading from Jeremiah, is our righteousness. “At the coming of our Lord Jesus with all his saints” is a reference to the Second Coming of Jesus at the end of time (last Sunday’s sermon) when he returns with all the saints who have preceded the living into glory. 29 And he told them a parable: “Look at the fig tree, and all the trees. 30As soon as they come out in leaf, you see for yourselves and know that the summer is already near. 31So also, when you see these things taking place, you know that the kingdom of God is near. 32Truly, I say to you, this generation will not pass away until all has taken place. 33Heaven and earth will pass away, but my words will not pass away. 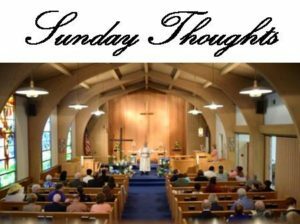 My Initial Thoughts: With this Sunday, we are beginning “series C” of our lectionary. This means that our Gospel lessons will be drawn mainly from the Gospel of Luke for the next year. You will notice that this lesson is VERY similar to our Gospel lesson from Mark last week. If you don’t remember the sermon, you can listen to it again and have an excellent idea of my initial thoughts on this text. The only thing I’ll lift out here is the phrase “this generation.” Jesus is referring to the time period stretching between his Incarnation and his Second Coming. We are not to expect some other “generation,” some different “dispensation,” prior to his return. May the Lord use this to help us prepare for our worship on Sunday.